Amsterdam Commuter Bicycle | A true commuter revolution. Cycling is no longer just a hobby for the weekends. It can be a part of your everyday life adding value to your journey. Commuter bicycles make your daily travel a breeze, avoiding grid-lock or squeezing onto a train, tram or bus in peak hour traffic. With our cities populations increasing; roads are getting busier, challenging commuters all across Australia. Commuter bikes are becoming progressively more popular to overcome this hurdle. Here at Lekker we have created the Amsterdam Series to cater for our commuters combining style with top-notch quality. We also have a range of accessories to customise your bike to your liking. You just know with a Lekker bike you are getting quality. With a commuter bicycle value for money is a must and the Amsterdam Series certainly delivers. Our commuter bikes are built to last with premium materials and fine craftsmanship. Every inch of these bikes are designed to add style along with great design to your everyday travel. The Amsterdam Series has a variety of options including single speed/fixed, 2-speed, 3-speed and “infinite” speed. It depends on your needs and these commuter bikes can be adapted to suit you. We have teamed up with Shimano to offer a 3 speed model with the integrated gear hub. Our team avoided using the traditional derailleurs to minimise the maintenance hassles and cost. The integrated gear hub also provides a smoother ride than the derailleurs which is essential on those longer commutes. If you are searching for more gears then look no further. 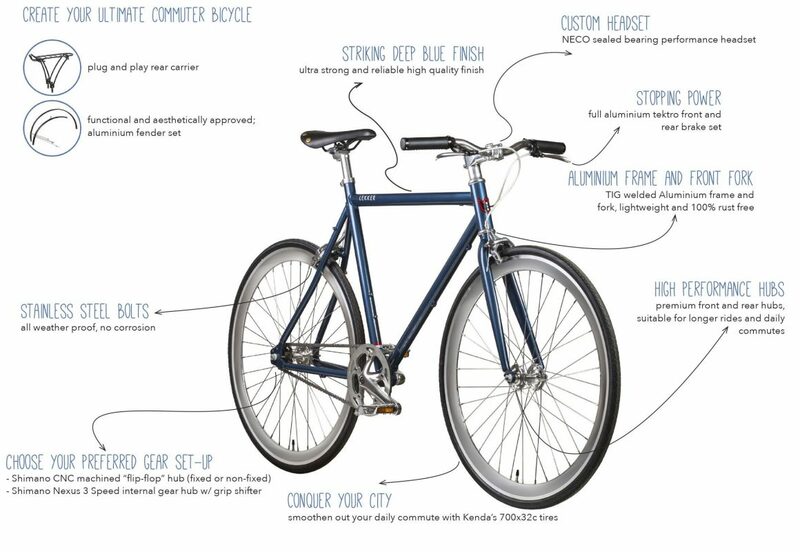 We have the ultimate commuter bike that comes with infinite number of gears. The Amsterdam Elite NuVinci 360 gearing system is easy to use and allows you to move through infinite gears effortlessly. It’s ridiculously easy to use making it suitable for any rider. A simple twist of the shifter on the handlebar is all it takes. The NuVinci 360 gear hub is particularly suited to the commuter bicycle as it reduces the upkeep and creates smooth transitions between gears as you commute to and from work. The Amsterdam Elite NuVinci takes it to the next level with its carbon belt instead of a traditional chain, which means no lubrication is required further reducing the need for maintenance. A great addition to your commuter bike is the rear commuter carrier rack. In a trendy Porteur style the rack offers a lightweight steel option to store your stuff securely. We have even integrated a rear red light to make sure you are seen at night because your safety is important to us. Combining practicality with retro-style the carrier rack is a smart accessory which can be fitted at one of our stores. Be prepared for any weather. We have a range of accessories including the foldable rear mudguard that is designed for our bikes. Keep it on hand on your commute and simply use when needed. It’s compact and can be easily stored, then if it starts raining unfold it and install within seconds. It’s a high quality product produced in Amsterdam and super effective. The mud guards are made from recycled and recyclable plastic to be mindful of our environment. Change your handlebars to suit you. Lekker offers a range of handlebars so that you can customise your ride. Having the features that you want make this the best commuter bike for you. Working late? No problem! Lekker’s very own bike light clicks on to get you home safe and sound. The high output LED light makes sure you are seen whilst the retro casing to gives a stylish look. Commuter bicycles are fast and work around pedestrians and traffic so it’s important to be noticed well in advance. We know how important safety is and provide one at no additional cost with your purchase. The high quality, functionality, custom features and performance set apart the Amsterdam Series from other commuter bicycles. However, the look really defines this commuter bike. Its look represents the ultimate in urban cool and stands out from the crowd. Create your dream bike to reflect your style. Transform your urban commute with the Amsterdam Series. Invest in quality and a classic retro-style that is designed to last. With deluxe accessories Lekker can tailor a commuter bike to suit your needs and style.